Accuweb Hosting Review 2019: Is Accuweb Hosting a Good Hosting? AccuWeb, approved by Microsoft as a WebMatrix Compatible Hosting company, is a popular VPS hosting service with cPanel installation, Softaculous, daily backups, and SSL certification. The hosting service offers a wide variety of packages, and all plans come with a money-back guarantee. Founded in New Jersey in 2003, AccuWeb Hosting not only offers a wide range of hosting services, they’re also approved by Microsoft as a WebMatrix Compatible Hosting company, and they’re one of the recommended vendors for several ASP.NET components. Computer and systems engineering students can get a free, fully-featured student hosting package. AccuWeb Hosting’s VPS plans are highly configurable, which explains why they’re a popular choice for users in the market for VPS hosting. 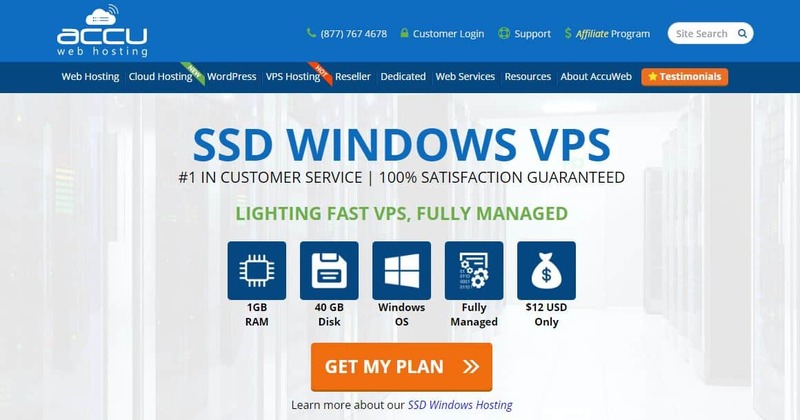 Their Windows VPS hosting plans are particularly attractive, since there is no extra fee if you choose a Windows license instead of a Linux installation. Their shared hosting plans aren’t too shabby, either. They’ve chosen to set their plans apart from the crowd by offering a generous amount of pure SSD storage with every plan. Plus, they come with SSL certification, free daily backups, and the LiteSpeedWebServer to ensure fast page loading speeds. Account management is straightforward with the included cPanel installation (SolidCP or Plesk for VPS hosting plans). You can install over 300 apps in one click with the help of Softaculous, and you can even have their team install the apps for you immediately upon purchase of a hosting package. Their uptime rating is excellent, with a 99.9% uptime guarantee. In short, they’ve got pretty much any hosting package you could possibly need, and their plans can be customized for whatever stage your business is in at the moment. AccuWeb promises hassle-free cancellation, and there’s a money-back guarantee (minus the licensing cost of the Plesk control panel). You’ll still have to submit a support ticket if you want to upgrade or downgrade your hosting plan, though, as there’s no option to do it directly from your management portal. Do note that Premium Windows VPS plans cannot be upgraded or downgraded because of how the clusters are organized, and HyperV VPS plans cannot be downgraded. Interestingly, they provide free hosting for computer and systems engineering students, though there are a few criteria that must be fulfilled before students are eligible. The free student hosting package is fully-featured and even comes with 25 email accounts. AccuWeb Hosting provides round-the-clock support through live chat, email, telephone, an extensive knowledge base, and even a blog with short articles explaining the various technical elements of hosting. When I tested their live chat, I was connected with a support agent in under 30 seconds. He was personable and polite, answering all my technical questions with ease. It’s no surprise that AccuWeb Hosting is a recommended choice for many businesses: their affordable, scalable plans are packed with features, and they’ve done their best to create a hassle-free experience for their customer base. Wondering how Accuweb Hosting stacks up against other Web Hosting companies? Enter any other Web Hosting company and we will give you a side-by-side comparison.